Don't you love chicken wings and football? It's a shame the Super Bowl is over (congratulations, Patriots!) — but that doesn't mean you can't whip these up in a whim for a delicious pre-dinner appetizer. Serve and enjoy with friends and family alike. Christian. Disabled veteran. Father. Named "One of the 10 best cooks in America" by Food Network, World Food Championship Qualified. Set the Anova Sous Vide Precision Cooker to 140ºF (60ºC). Lightly season the chicken wings with salt and pepper. Place in a large vacuum seal bag and seal using the water immersion technique. Place the bag in the water bath and set the timer for 45 minutes. Meanwhile, prepare the sauce: In a large bowl, combine the hoisin, teriyaki, miring, and ginger. Set aside. When the timer goes off, remove the bag from the water bath. Remove the wings from the water bath and pat very dry with paper towels. Pour about 2 inches of vegetable oil into a large Dutch oven. Heat oil to 375ºF over medium-high heat. When the oil is hot, add the wings and fry until golden brown, 1 to 2 minutes. As soon as the wings come out of the fryer, transfer them to the bowl with the sauce. Toss to coat. 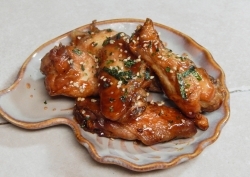 Transfer wings to a serving plate and garnish with furikake. Serve.